Cabbage (36%), Rapeseed Oil, Celery, Apple (7%), Raisins (7%), Walnuts (5%), Pasteurised Free Range Egg Yolk, Sugar, Spirit Vinegar, Salt, Mustard Powder, Sunflower Oil. 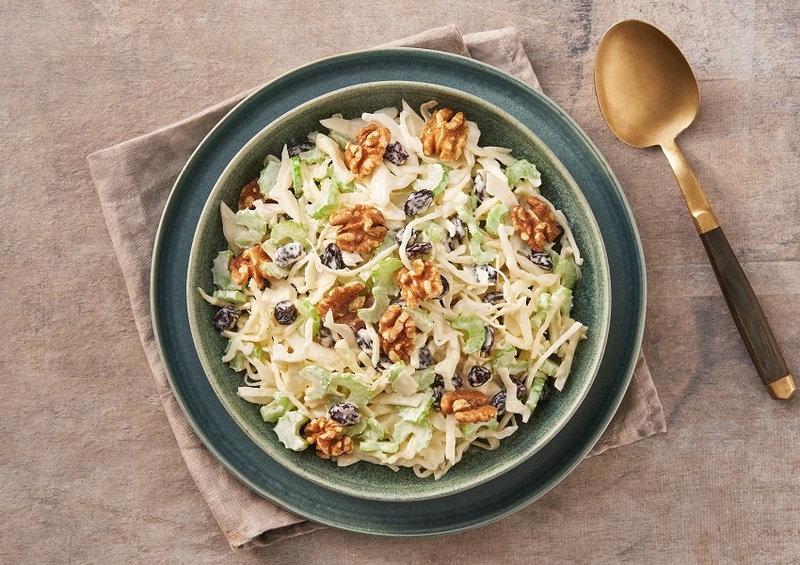 Cabbage, apple and raisins in a mayonnaise dressing topped with walnuts. This product is ready to eat. Although every care has been taken to remove all shell, some may remain. Keep refrigerated. This product is not suitable for home freezing. Produced in the United Kingdom. We are happy to replace this item if it is not satisfactory. The above details have been prepared to help you select suitable products. Products and their ingredients are liable to change. You should always read the label before consuming or using the product and never rely solely on the information presented here.